The skies grew black in the middle of the day Sunday as the Moon slipped in front of the Sun and aligned with the Earth, blotting out the sunshine that just moments earlier had swathed the island's silent, ancient stone guardians. "It was like being in the stadium at night with artificial light. It was like being in a dark room with a 10-watt bulb," awe-struck local official Francisco Haoa told AFP. "It started with a shadow. The skies were perfectly blue, with lots of wind that chased away the clouds. Everyone applauded. The sun is seen partially covered by the moon on Easter Island, 3700 km off the Chilean coast in the Pacific Ocean. "We saw a luminous object near here and people started saying they were sure it was a UFO." "It was like the Sun was smiling," said eight-year-old Hinanui. "The Sun seemed like a horizontal crescent, then the Moon covered up the bottom of the Sun, which reappeared again as a crescent." An estimated 4,000 tourists, scientists, photographers, filmmakers and journalists flocked to this World Heritage site of only 160 square kilometers (60 square miles), doubling the barren island's population. Throughout human history, superstition, awe and dread -- fears for the birth or death of kings, victories or defeats, bumper harvests or gnawing hunger -- have attended the moment when the Earth is plunged into daytime darkness. 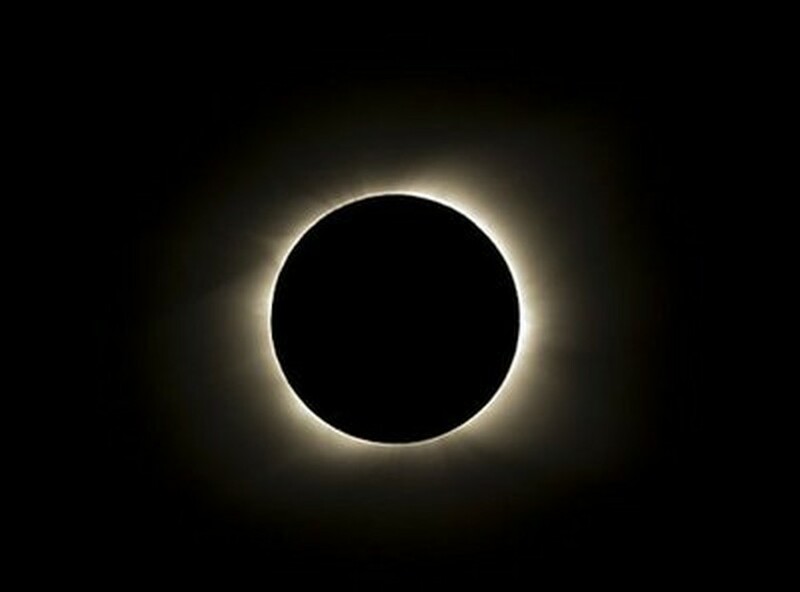 In local ancient lore, such an eclipse "would have been seen as a very powerful signal of upcoming upheaval," as their world view was rooted in nature, in "the earth, the sea and especially the sky," said Patricia Vargas of the University of Chile. A French and a Japanese tourist were arrested for mounting "platforms where they are not allowed to touch and climb the statues," said police chief Cristian Gonzalez. "Easter Island is an open-air museum, and the eclipse is part of this museum," she added. The eclipse has brought a tourist boom to Easter Island and Tahiti, where American film director James Cameron was among the stargazers helping to bring a 10.8-million-dollar tourism bonanza to the archipelago. "We are pleased and excited by the interest generated by the eclipse. The five daily flights arriving in El Calafate were full on Friday and Saturday, and the climate is excellent for watching," said tourism director Ana Ianni. Forecasters said there were clear skies with below-freezing temperatures in the southern hemisphere winter, with all-terrain vehicles needed to brave the snowy mountains.